Classic and familiar single-cutaway style melds with powerful sound and Jackson's illustrious legacy of cutting-edge design and construction for a top-notch guitar. Whether you play with crystal-clear clean tones or thick, heavily saturated distortion, the JS Series Monarkh SC JS22Q easily keeps up with any style you can throw at it. Ideal for modern metal, this instrument is the ultimate complement to your music, as creative as your playing. The SC JS22Q offers a slightly shorter (24.75") scale length than most of our six-string guitars, and features a poplar body with a beautiful quilt maple top and a bolt-on maple speed neck with graphite reinforcement and scarf joint. Designed for flexible playing, the 12"-16" compound radius amaranth fingerboard is curved for easy chord playing near the nut, flattening out for playing smoking leads without fear of fretting out during bends. The Jackson compound radius compensated bridge perfectly matches the fingerboard?s radius for accurate string action and spacing while chords stay in tune up and down the entire length of the neck. Two Jackson high-output humbucking pickups in the bridge and neck positions crank out clear tone with plenty of the girth required for current styles. The pickups' crisp, clear tone is channeled by a three-way toggle switch along with single tone and volume controls for versatile sound that matches any playing situation, and can cut through a thick mix to highlight your playing. When you plug in a Jackson, you're plugging in a legend. For over three decades our guitars have fueled musical revolutions, setting stages ablaze with fiery playing. 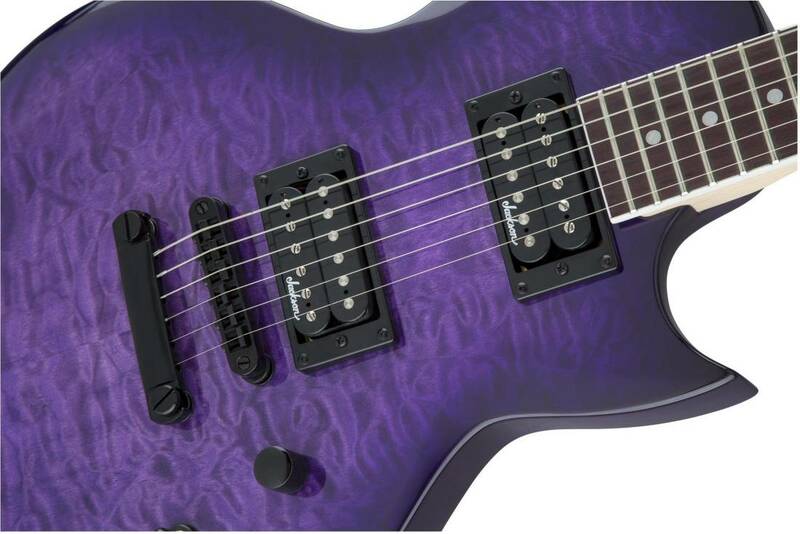 Available in Transparent Purple Burst with black hardware, the JS Series Monarkh SC JS22Q is a sterling addition to any guitar collection-both powerful and gorgeous.